We Are All Dominican | A campaign of the Dominican diaspora and allies to defend human rights in the Dominican Republic, build solidarity, and mobilize for an inclusive Dominican national identity. We Are All Dominican (WAAD) is building towards a more just and inclusive Dominican society that embraces its diversity and legally recognizes the citizenship rights of Dominicans of Haitian descent. We Are All Dominican (WAAD) works in solidarity with movements led by Dominicans of Haitian descent fighting for inclusion and citizenship rights, and seeks to educate and activate the Dominican diaspora in order to challenge anti-Haitian and anti-black discourses. We Are All Dominican (WAAD) is a collective of students, educators, scholars, artists, activists, and community members of Dominican and Haitian descent residing in New York City. We formed in October 2013 in the aftermath of a decision by the Dominican Constitutional Tribunal to revoke the citizenship of Dominicans born to undocumented immigrant parents, the vast majority of whom are of Haitian origin. WAAD organizes panel discussions, community art workshops, protests, vigils, and street outreach to raise awareness on the human rights violations that more than four generations of Dominicans of Haitian descent face as their right to a Dominican nationality is stripped away and denied by the Dominican government. Dominicans of Haitian descent have seen their lives paralyzed as their own government refuses to recognize their nationality and grant them the identity documents needed to go to school, work, get married, register one’s children at birth, and other basic life activities. As immigrants and the children of immigrants ourselves, Dominican-Americans know firsthand the marginalization and discrimination that migrants and their families face all over the world. 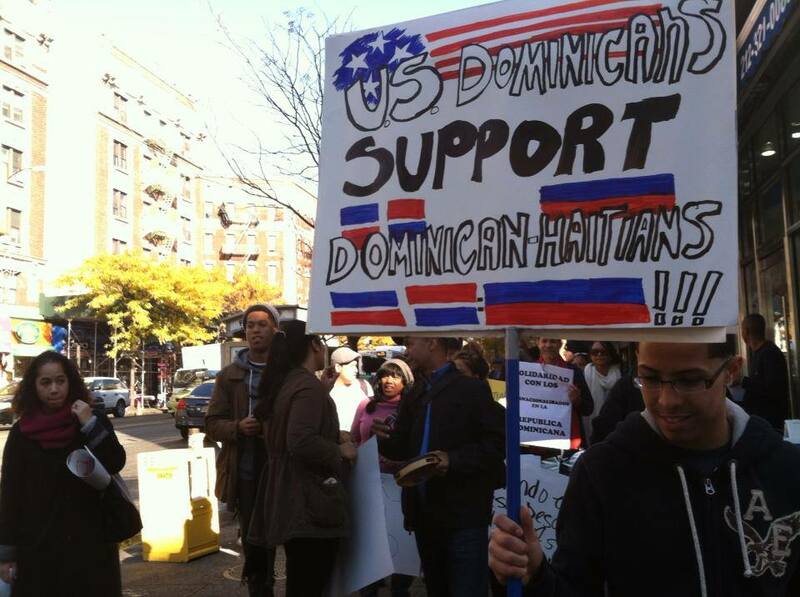 We stand in solidarity with the struggle of Dominicans of Haitian descent to restore their right to a nationality. The name We Are All Dominican is a recognition of their identity, in resistance to the government’s effort to deny their nationality, their fundamental rights, and their humanity. We Are All Dominican fights against injustices targeted at Dominicans of Haitian descent and their families because of deep-rooted anti-Haitianism in the Dominican Republic. The mainstream Dominican diaspora often reproduces these prejudices and discriminatory attitudes. Therefore, we aim to build a base of Dominican-Americans who are committed to racial justice by raising awareness about and supporting the movement for citizenship, civil, and political rights in the Dominican Republic. As Dominican-Americans and allies, we must make a greater effort to engage in dialogue with our families, friends, and co-workers to discuss the common structural racism underlying the Dominican government’s discriminatory policies and injustices faced by black and brown communities in the United States. WAAD recognizes these connections and seeks to educate and activate Dominicans to turn the tide. WAAD aims to bring more Dominicans to a larger, multi-ethnic, cross-class conversation on denationalization, human rights violations, and racism in order to foster transnational solidarity. Exactly two years after the Dominican Constitutional Tribunal issued a ruling (Sentencia 168-13) that retroactively revoked the citizenship of Dominicans of Haitian descent — creating the largest population of stateless people in the Western Hemisphere — Seton Hall’s School of Diplomacy is hosting former Dominican president Leonel Fernández, the architect of this egregious policy and signing deals with him. Latino Justice PRLDEF, We Are All Dominican, the Haitian-American Lawyers Association of New York and a range of other community groups, activists, and elected officials have sent a letter to Seton Hall and its School of Diplomacy to protest this decision. On Sunday, August 9, We Are All Dominican will be participating in the Dominican Day Parade in New York City as an expression of solidarity with our Dominican brothers and sisters of Haitian descent who have been stripped of their citizenship and face the threat of expulsion from the only home they’ve ever known. We will march in celebration of the rich diversity of the Dominican people, particularly our Afro-Dominican heritage, and as an affirmation that Black Lives Matter in the U.S., in the Dominican Republic, and around the world. We will march for our vision for a more inclusive Dominican society, one that does not marginalize and disenfranchise its most vulnerable citizens. We have been heartened in recent months by the solidarity and activism of justice-loving people in the Dominican Republic, the United States, and elsewhere, in defense of the rights of Dominicans of Haitian descent. On two trips to the Dominican Republic this year, the organizers of We Are All Dominican have been inspired by the immense strength of Dominicans of Haitian descent in organizations such as Reconocido, MOSCTHA, and MUDHA, who have mobilized in the courts, in government administrative offices, on the streets, and in the bateyes to defend their rights. Prominent Dominican journalists such as Juan Bolívar Díaz and Marino Zapete have powerfully stood up for Dominicans of Haitian descent, even in the face of intimidation and death threats. Last month, we were honored to have taken part in the Movement for Black Lives convening in Cleveland, where we were joined by two fierce human rights activists, powerful Dominican women of Haitian descent, who came to speak directly about their struggle in the Dominican Republic. It was a global black family reunion of 1,500 brilliant activists and organizers that included thoughtful dialogue about what is respectful transnational solidarity. The organizers of the the convening were intentional about creating space to discuss the movement for human rights and against anti-blackness in the Dominican Republic. Participants from the U.S and Europe learned about denationalization in the DR and were moved to action. Similarly our family from the Dominican Republic were witness to testimonies from families of people murdered by police and saw themselves reflected in their pain. The diversity of our various struggles were highlighted throughout the convening while centering blackness and the importance of continuously making connections across borders. Throughout the summer, members of the Dominican and Haitian diasporas, and our allies, have marched in New York City, Miami, Chicago, Boston, Washington, DC, and Montreal in solidarity with our brothers and sisters facing denationalization and expulsion from their home. Now we are bringing the #DRSummerOfJustice to the Dominican Day Parade to express our ongoing commitment to the struggle for for racial justice and equality in the Dominican Republic. For years, tens of thousands of Dominicans of Haitian descent have seen their lives paralyzed as their own government refuses to recognize their nationality and grant them the identity documents needed to go to school, work, get married, register one’s children at birth, and other basic life activities. As immigrants and the children of immigrants ourselves, Dominican-Americans know firsthand the marginalization and discrimination that migrants and their families face all over the world. We must join the struggle of Dominicans of Haitian descent to restore their right to a nationality. While We Are All Dominican does not support a tourism boycott of the Dominican Republic, we urge all Dominican-Americans, particularly our elected representatives, to come together to hold the Dominican government accountable for years of egregious human rights violations against Dominicans of Haitian descent. We cannot sit silently as tens of thousands of our brothers and sisters of Haitian descent face statelessness and expulsion from the only home they have ever known. As Dominican-Americans we must make a greater effort to engage in dialogue with our families, friends, co-workers to discuss the commonalities between the Dominican government’s discriminatory immigration and citizenship policies and the structural racism faced by black and brown communities in the United States. We must continually ask ourselves how we can continue to build and heal within our communities. We will march on Sunday’s Dominican Day Parade as an act of healing. This celebration of our diversity is an essential part of the struggle for human rights in the Dominican Republic and among its diaspora. We wish to commemorate heroines such as Mamá Tingó, Sonia Pierre, and all of the men and women who tirelessly fight for justice in the Dominican Republic. We will march in solidarity with our brothers and sisters of Haitian descent who have been denied their nationality and declare that we are ALL Dominican. El domingo, 9 de agosto, Todxs Somos Dominicanxs (We Are All Dominican) participará en el desfile dominicano en la ciudad de Nueva York como una expresión de solidaridad con nuestros/as hermanos y hermanas dominicanos/as de ascendencia haitiana, quienes han sido despojados/as de su ciudadanía y enfrentan la amenaza de expulsión de la tierra que los/as vio nacer. Vamos a marchar en la celebración de la gran diversidad del pueblo dominicano, sobre todo nuestra herencia Afro-Dominicana, y como una afirmación de que las vidas negras important en los EE.UU., en la República Dominicana, y en todo el mundo. Vamos a marchar por nuestra visión de una sociedad dominicana más inclusiva, una que no margina ni viola los derechos de sus ciudadanos/as más vulnerables. En los últimos meses nos ha animado ver la solidaridad y el activismo de personas luchadoras en la República Dominicana, los Estados Unidos, y en otros lugares, por la defensa de los derechos de los/as dominicanos/as de ascendencia haitiana. En dos viajes a la República Dominicana realizados este año por los/as organizadores/as de Todxs Somos Dominicanos/as, quedamos abrumados/as al ver la inmensa fuerza de los/as dominicanos/as de ascendencia haitiana en organizaciones como Reconocido, MOSCTHA y MUDHA, quienes se han movilizado en los tribunales, en la Junta Central Electoral, en las calles y en los bateyes para defender sus derechos. Destacados periodistas dominicanos como Juan Bolívar Díaz y Marino Zapete se han pronunciado indiscutiblemente a favor de los derechos de los/as dominicanos/as de ascendencia haitiana, a pesar de recibir reiteradas amenazas. El mes pasado, tuvimos el honor de haber participado en el Encuentro del Movimiento por la Vidas Negras en la ciudad de Cleveland, donde nos acompañaron dos activistas de derechos humanos, poderosas mujeres dominicanas de ascendencia haitiana, las cuales vinieron a hablar directamente sobre su lucha en la República Dominicana. Fue un encuentro para la familia negra a nivel mundial, 1.500 activistas brillantes, en donde se abordó un diálogo sobre la solidaridad transnacional. Los/as organizadores/as del encuentro priorizaron la creación de un espacio para reflexionar sobre el movimiento por los derechos humanos y actitudes anti-negras en la República Dominicana. Los participantes de los EE.UU. y Europa aprendieron sobre la desnacionalización en la República Dominicana y quedaron motivados/as a aportar a la lucha. Del mismo modo nuestra familia dominican presenciaron testimonios de familiares de personas asesinadas por la policía y se solidarizaron con su dolor. La diversidad de nuestras luchas se destacaron a lo largo del encuentro, destacando la negritud y la importancia de construir lazos que cruzan las fronteras. A lo largo del verano, la diáspora dominicana y haitiana, y nuestros/as aliados/as, han realizado manifestaciones en la ciudad de Nueva York, Miami, Chicago, Boston, Washington, DC, y Montreal, en solidaridad con nuestros/as hermanos y hermanas que enfrentan la desnacionalización y la expulsión de su propio país. Ahora el #VeranoPorLaJusticia (#DRSummerOfJustice) llega al desfile dominicano, en donde expresaremos nuestro compromiso con la lucha por la justicia racial y la igualdad en la República Dominicana. En los últimos años, las vidas de decenas de miles de dominicanos/as de ascendencia haitiana han quedado en suspenso por su propio gobierno, el cual se niega a reconocer su nacionalidad y emitir los documentos de identidad indispensables para estudiar, trabajar, casarse, declarar hijos/as al nacer, y otras actividades básicas de la vida. Como inmigrantes e hijos/as de inmigrantes, los dominico-americanos conocemos de primera mano la exclusión y la discriminación que enfrentan los/as migrantes y sus familias en todo el mundo. Debemos unirnos a la lucha de los/as dominicanos/as de ascendencia haitiana para restaurar su derecho a la nacionalidad. Aunque que Todxs Somos Dominicanxs (We Are All Dominican) no apoya un boicot al turismo, hacemos un llamado a todos/as los/as dominico-americanos/as, sobre todo a nuestros/as representantes en el gobierno, a instar al gobierno dominicano a hacerse responsable por las graves violaciones a los derechos humanos de los/as dominicanos/as de ascendencia haitiana. No podemos guardar silencio mientras decenas de miles de nuestros/as hermanos y hermanas son convertidos/as en apátridas y podrían ser expulsados del país que los vio nacer. Los/as dominicano-americanos/as tenemos el deber de dialogar con nuestras familias, amigos/as, y colegas sobre las semejanzas entre las políticas de inmigración y ciudadanía discriminatorias del gobierno dominicano y el racismo estructural que enfrentan las comunidades negras y minoritarias en los Estados Unidos. Debemos preguntarnos continuamente cómo podemos seguir construyendo y sanar nuestras comunidades. Marcharemos en el desfile dominicano como una experiencia sanadora. Esta celebración de nuestra diversidad es una parte esencial de la lucha por los derechos humanos en la República Dominicana y entre su diáspora en los Estados Unidos. Queremos conmemorar heroínas como Mamá Tingó y Sonia Pierre, y a todos/as los/as hombres y mujeres que luchan por la justicia en la República Dominicana. Vamos a marchar en solidaridad con nuestros hermanos y hermanas de ascendencia haitiana, a quienes se les ha negado su nacionalidad, y declararemos que TODOS/AS somos dominicanos/as. Deportations in the Dominican Republic! The movement for black liberation is global. 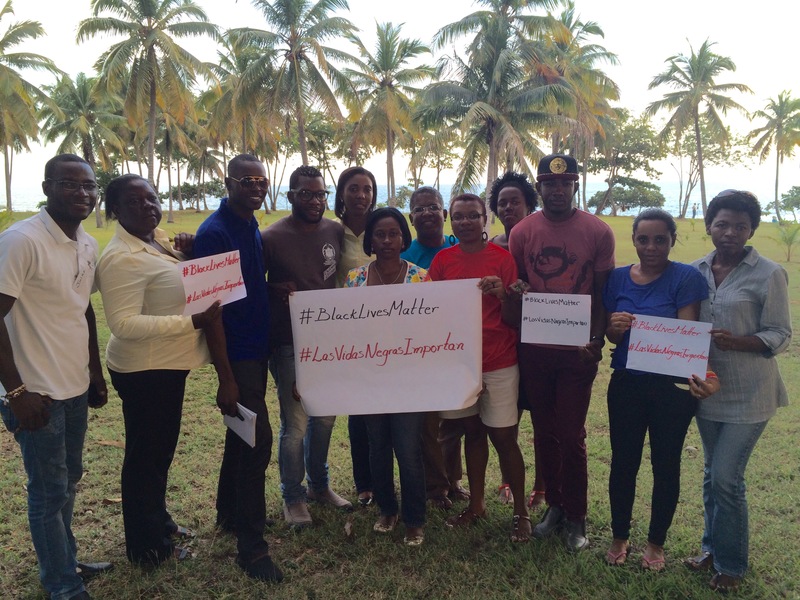 From Charleston to Santo Domingo — BLACK LIVES MATTER! We Are All Dominican wants to connect the struggles of African peoples and highlight the state-sponsored oppression Dominicans of Haitian descent and Haitian migrants are facing in the Dominican Republic. Dominicans of Haitian descent and to deport Haitian migrants, many of whom have lived in the country for decades. Communities with a large concentration of Haitian descendants are being patrolled by military police who rely on racial profiling to determine who is not a “Dominican.” Families are being separated, men and women are beaten alike, homes are robbed and destroyed and thousands have already been expelled from the country. These acts of state violence have intimidated many into fleeing their homes and head to the border of DR/Haiti where the only certainty is further oppression. Take action on behalf of Dominicans of Haitian descent and Haitian migrants facing statelessness and deportations in the Dominican Republic! We are looking to collaborate with students, activists, and community members by providing an informational toolkit about denationalization and deportation in the Dominican Republic. You can help spread the word about this issue and organize people by putting together a teach-in, movie screening, or community discussion. Check out the We Are All Dominican Toolkit here. We Are All Dominican expresses its rejection of the Dominican government’s new publicity campaign regarding Dominicans of Haitian descent and the regularization plan. In the video “I have my papers” the government presents a false narrative of the experience of Dominicans of Haitian descent and Haitian migrants in navigating the bureaucratic and legal labyrinth established by the Dominican government to deprive Dominican-born people of their citizenship and to create near-impossible hurdles to obtaining legal immigration status, respectively. It also does not reflect the intimidation and fear facing Haitian migrants who have been fleeing the country since the end of the registration period (See report by Vice News here). The piece refers to Dominicans of Haitian descent as “Haitians,” despite also acknowledging that they were born in the Dominican Republic. With this propaganda the Dominican government wishes to show that it has completed its long process of converting hundreds of thousands of people born on Dominican soil at a time when the Constitution recognized them as citizens, into foreigners. We were not convinced by its shameless legal manipulations and we are not convinced by this lame propaganda. We are ALL Dominican! La agrupación We Are All Dominican (Somos Todos/as Dominicanos/as) rechaza rotundamente la nueva campaña publicitaria del gobierno dominicano sobre dominicanos/as de ascendencia haitiana y el plan de regularización. El video “Ya tengo mis papeles” presenta una imagen falsa de la experiencia de dominicanos/as de ascendencia haitiana y migrantes haitianos/as en navegar el laberinto burocrático-legal establecido por el gobierno dominicano para despojar a personas nacidas en territorio dominicano de su ciudadanía y crear obstáculos imposibles para obtener un estátus migratorio regular, respectivamente. El video se refiere a los/as dominicanos/as de ascendencia haitiana como “haitianos,” a pesar de reconocer que nacieron en el país. Con esta propaganda el gobierno pretende demostrar que ha completado el largo proceso de convertir en extranjeros a cientos de miles de personas nacidas en territorio dominicano cuando la Constitución vidente los reconocía como dominicanos. No nos convencieron con sus manipulaciones legales y tampoco lo harán con esta propaganda. Somos TODOS/AS dominicanos/as!